It’s beginning to look a lot like Christmas in our home! Our tree is up and decorated… LOVE it! 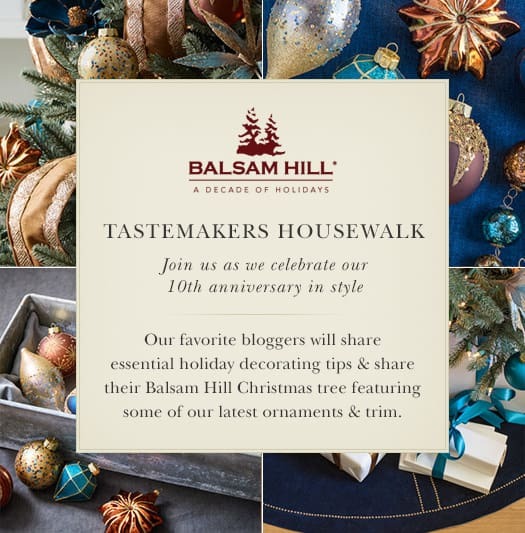 I was honored to be invited to join Balsam Hill as they celebrate their 10 year anniversary and was selected as one of their 10 Tastermaker Bloggers. We got to pick from their gorgeous themed ornament collections and I selected the beautiful, sparkly French Country Christmas ornaments… so pretty!!! Oh and I’ve got a giveaway below for a $150 Gift Certificate to Balsam Hill below…. I love this collection. Stunning Crackle French Country Ornaments…. and Foil French Country which reminds me of something just kissed with snow. The Champagne Acanthus flower picks just tied the whole tree together. I loved them so much that I used one as my tree topper this year. My family room just sparkles and glows at night. Courtney from French Country Cottage is sharing her gorgeous tree today too. Thank you Balsam Hill for supplying the gorgeous ornaments. All opinions expressed are my own. First, congrats on being one of the 10 tastemaker bloggers! Second, your tree is gorgeous! It’s my feature tomorrow at Welcome Home Wednesdays! Congrats! See you there! Congrats to Linda W.! How wonderful! Where do I find the winners to each of your contests/giveaways? I would love to congratulate the lucky winners! Thank you! Your Christmas tree looks so beautiful and I love your little tree topper. Have a great holiday season! I would love to buy the 72″ Juliette Fringed Tree Skirt. So pretty! I’d be happy with any of the Balsam Hill Christmas trees; they are all inspiring. Your tree is beautiful and a reflection of your talent. Love what you done with your tree it is so pretty. Thank you for the giveaway & the chance to win. I would love to get some new ornaments this year & they have a great selection. The hand-painted Nordic Christmas ornament set is stunningly beautiful! I would love to purchase the BLACK SPRUCE tree. Stunning tree love it! I like the Berkshire Mounatin Fir Wreath I’d add it to my mantle. Very pretty tree. I would select the French Country mercury ornaments. I like the colors and the fact that they are large ornaments. Beautiful tree!! I am happy to have found your blog! Balsam Hill is such a wonderful Holiday place. I think I would get the Gold and Silver Tree Decorations and some of the pics as well, if I won. It is realy hard to choose! Forgot to say that I probably would use it toward a tree… real trees just keep getting more expensive every year, so this would pay off in just a few years. I would like to get the NORWAY SPRUCE wreath, lighted. I love your tree! I really like the ornaments. Bet the lights do make them shine! I forgot to say what I would like to buy – I love the pinecone picks in the pack of 12. I truly just love your tree…it’s beautiful in it’s simplicity!! I have a crocheted tree skirt I made years ago and though I know my family is going to fight me on retiring it, I really need to. If I won I would get the cranberry ELIZABETH BEADED TREE SKIRT. It is really pretty and is more in line with the look I want now. I like the WINTER FROST GLASS ORNAMENT SET (35 PIECES). I love your tree. I would buy the winter frost glass ornament set!! So gorgeous!! Such a beautiful tree! I would love to get the Woodland ornament set. Thanks for the chance to win! Your tree is beautiful. I would definitely get a Slim Pre-lit tree! Such a gorgeously decorated tree. Anyone would be blessed to win this. Merry Christmas & blessings. This is a beautiful tree, decorated so very pretty by you. Anyone would be blessed to win this. Blessings. I love their german nativities and the LED outdoor Christmas trees. I love your tree!!!! It is magical and do lovely. BH has so many beautiful things to choose from. I’d love to win, thanks for the opportunity. Love it all! BH has such beautiful things. I am in love with the Cypress Topiary! It would be the perfect touch to my front porch this winter! Your tree is beautiful! If I won I would use the gift certificate toward a set of mercury glass ornaments and a Santa figurine, because we collect them. Your tree is beautiful!! If I won I would get the Crystal Palace Glass Ornament Set, 35 Pieces! Thanks for the chance to win! I love the Traditional tree and the White Vermont Garland. Your tree is so gorgeous, Maryann. Balsam Hill’s artificial trees, garland, and weraths look so real! I would love to have any of their Christmas decor. I’m obsessed with Mercury glass ornaments, and theirs are so beautiful. Love the tour, and thanks for the giveaway! I would get a combination of fall & Christmas decorations. Love your tree and trimmings! I love the Mercury Glass Ornaments in silver and red. I would love to have a Balsam Hill tree. Thank you for showing us your beautiful tree! I have to say the ornaments are the prettiest things I have ever seen! Can’t wait to visit the other homes! This is so gorgeous, Maryann! I love that French Country collection. So fun being on this tour with you! I love your tree, it so beautiful! Love that pick as a the tree topper, just gorgeous!